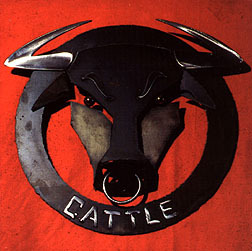 CD Review: Another White Male, "Cattle"
Had it not been for the poster of AWM's independent EP hanging on my wall at home, I might have actually forgotten about this Vancouver band during their year-or-two absence from the scene (read major label debut). Perfectly fitting the marketable mold that bridges elements of rock (the modern industrialized kind), punk (the youthful Vancouver kind) and metal (the Tool kind), Another White Male seem like many of the younger generation in their questioning of things, lots of things. But, really, these guys have every reason to believe in their music and stance. There is no shortage of desperation or try in their approach, and they sure as hell aren't brooding. Demanding your attention, opener "Angst" sounds like a leaner, angier bull than that of most Vancouver rock, and follow-up "Home" makes for some interesting songwriting, as well. But you really have to crank Cattle up if you desire a metal slant to things, as the guitars aren't overly prominent (or grungy) in the mix. On a punk level, the words provide for some engaging landscapes as you listen and/or read along to the music. "Deadweight" and "Common Buddha" blast away in urgent fashion at the disc's end, while a few of the middle tracks get a little closer to rock schmaltz ("Acid Coloured Eyes" and "Lovesong"). A cool release to build upon.